According to a Chronicle of Higher Education report last night, University of Central Florida President John C. Hitt is one of the highest paid public university presidents in the country. According to the Orlando Sentinel, Hitt was the only Florida president to make the list, coming in at ninth with a total compensation of $673,500 during the 2009-10 fiscal year. That amount includes base pay, bonuses and deferred-compensation payouts. The report also went on to say that Hitt ranked fourth in “total cost of employment.” The Sentinel reported that is the amount paid for salary and retirement, plus perks Hitt enjoys like housing and car allowances. That total was $800,703. Grant Heston, a UCF spokesman, told the Sentinel that Hitt’s total compensation is notable because about 30 percent of it is tied to UCF achieving specific goals. If the goals are not met, Hitt doesn’t receive the extra compensation. Hitt’s base pay in 2009-2010 was $463,500. 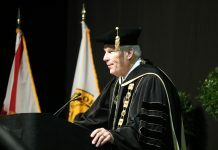 During his 19 years as president, UCF’s enrollment has more than doubled, research funding has more than tripled and the number of doctoral degrees awarded each year has more than quadrupled, Heston told the Sentinel. The medical school at Lake Nona and the on campus football stadium came about during Hitt’s time as president. Still, news of Hitt being among the highest paid presidents in the nation comes at a time KnightNews.com is hearing complaints from students over the rising cost of tuition and fees at UCF. Several new fee hikes were just approved by the UCF Board of Trustees. UCF is the largest University in the state and second largest in the country.